George Stubbs (1724-1806) was classified in his lifetime as a sporting painter, and as such was excluded from full membership of the Royal Academy. 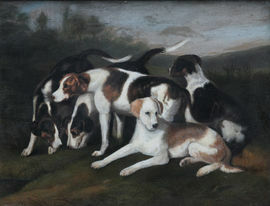 He is best remembered for his paintings of horses and other animals and his conversation pieces. Having studied anatomy, Stubbs's pictures of horses are among the most accurate ever painted, but his work is lyrical and transcends naturalism. Like Gainsborough, he later painted scenes of peasant life, as well as studies of wild and exotic animals. He also became known as a printmaker and for his paintings in enamel on Wedgwood earthenware plaques.